Has Pokemon Go fever hit your house yet? My son has spent hours walking around our neighborhood this week hunting little cartoon beasties. I’ll admit I gave it a try. I downloaded the app on my phone, spotted a critter at the restaurant when we went out to dinner that evening…and had to ask the 9-year-old at the next table what to do with it. So, apparently, video games are not my strong suit. 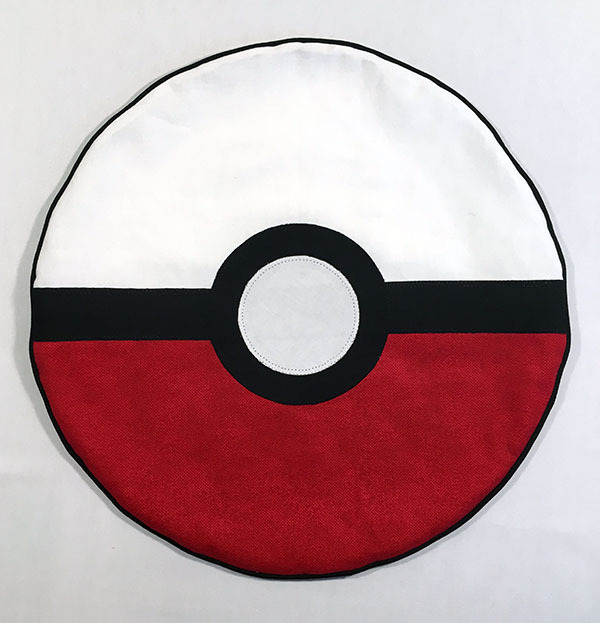 But since anything that gets my air conditioning-loving teenager out of the house is a good thing, I did a little poke-crafting in celebration and made him a Pokeball pillow for his room. Don’t let the piping and the zipper scare you off. This is a very simple project! 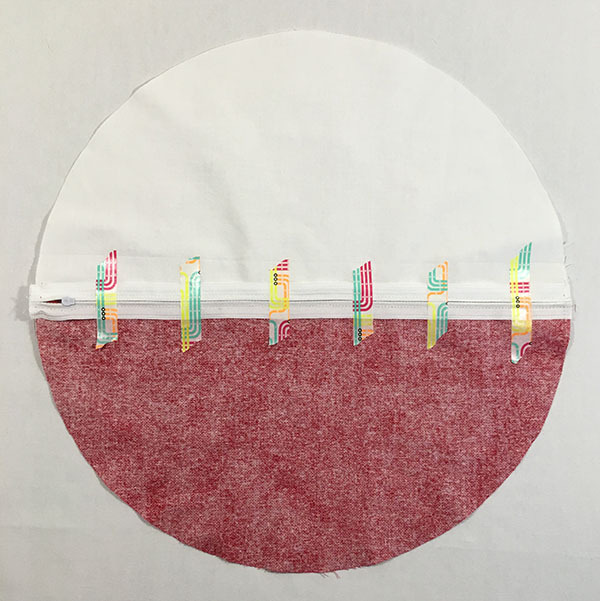 Print out the pillow pattern (download here) and tape the two pillow cover pieces together to form a half circle. 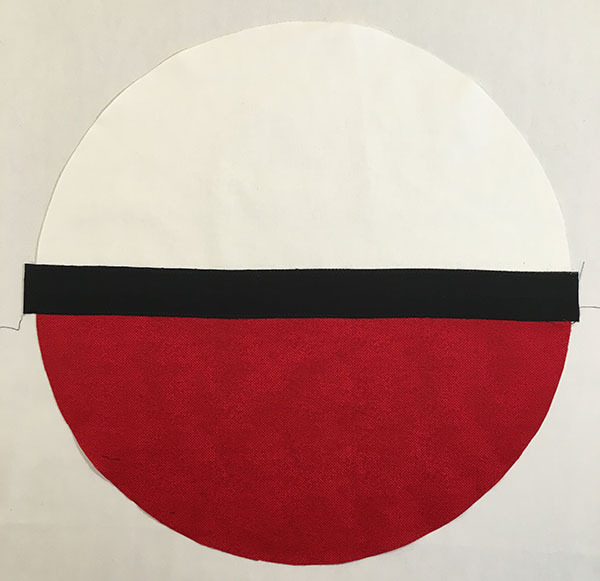 Use the pattern to cut out two half circles from the white fabric and two from the red. 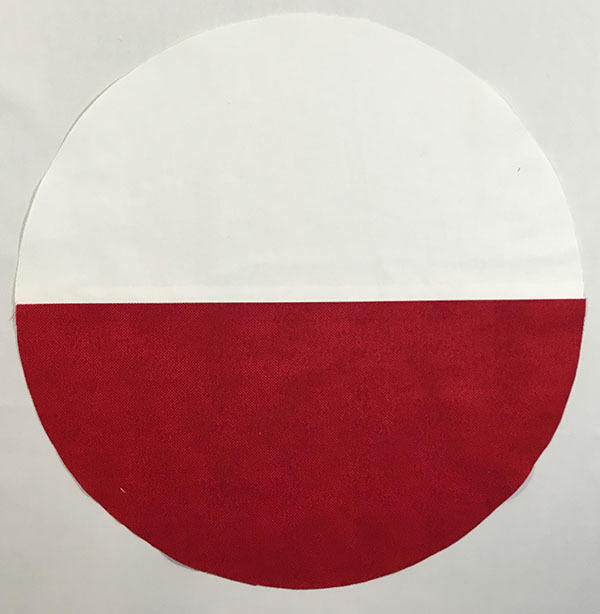 Also cut a large circle from black fabric and a small circle from white fabric as indicated on the pattern pieces, plus a strip of black fabric 1-1/2″ wide and 16-1/2″ long. 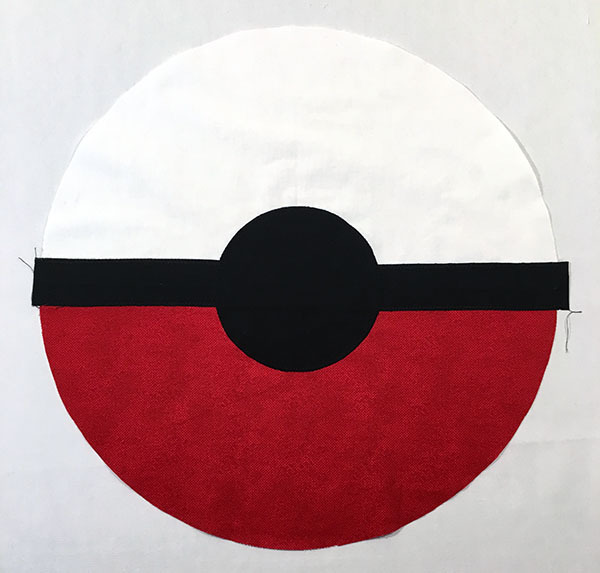 Pin one white and one red half circle together, right sides facing, and stitch together along the straight edge with a 1/2″ seam. Repeat with the other two half circles. Press the seams open and set one of the assembled circles aside for now. Turn the other assembled circle wrong side up and center your zipper over the seam line. Ready for a nifty trick? Instead of pinning the zipper, tape it in place with any tape that you can sew through and peel off easily. I used washi tape, but frosted scotch tape or masking tape will work, too. Taping the zipper keeps much straighter when you sew than pinning. 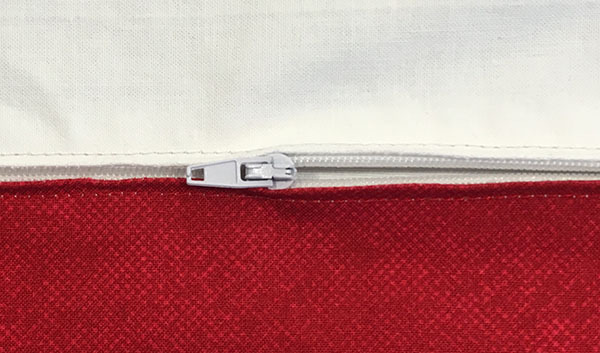 Using a zipper foot, sew close to the zipper teeth on either side. 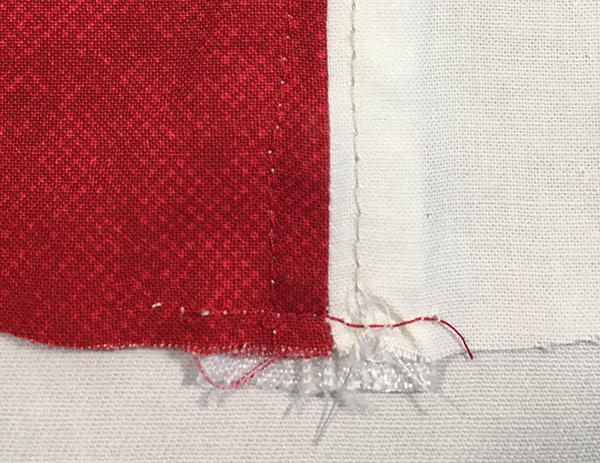 I switched my bobbin thread so it was red when I was sewing on the red side of the zipper and white when I was sewing on the white side of the zipper. If your zipper is longer than your fabric, tack a few stitches across either end to help avoid losing the zipper tab off the end. 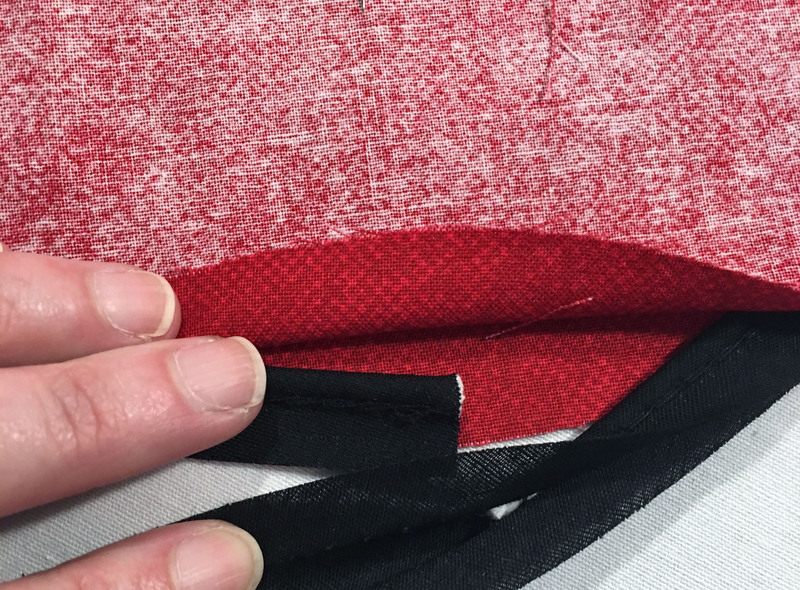 Remove the tape and use a seam ripper to carefully unpick the center seam. See, that was easy! Set the pillow back aside. 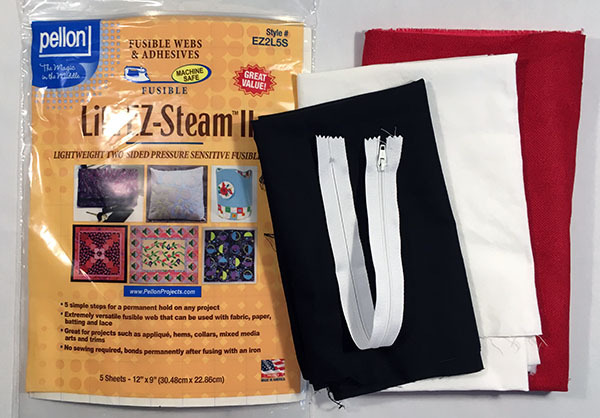 Apply the EZ-Steam II to the black strip, black circle and white circle. Center the black strip on the right side of the remaining assembled circle. 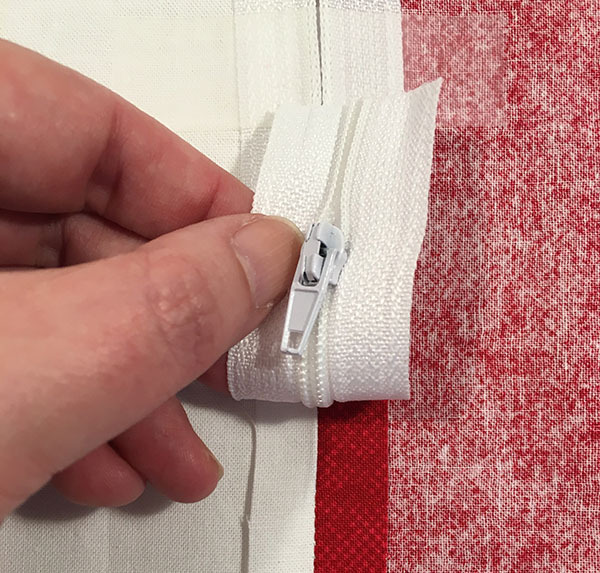 To help align it, you can fold the strip in half lengthwise, right sides together (NOT sticky side together or you’ll have a mess! ), and finger press to mark a center line. Iron the strip into place following the manufacturer’s instructions. 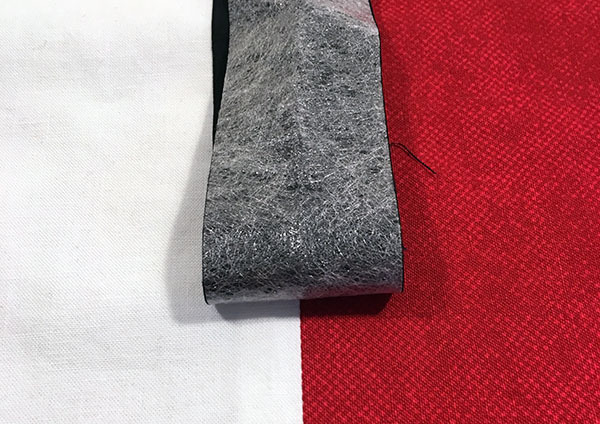 Switch to black thread in the top and bobbin, set your sewing machine for a tight, narrow zigzag, and stitch along both long sides of the black strip. Center the black circle over the black strip, and zigzag all around the edge. To keep the threads from unravelling, I like to leave a long tail and use a hand sewing needle to pull them both through to the back side. Tie the tails in a knot and then trim the ends. Center the white circle in the middle of the black circle, switch to white thread and a white bobbin, and zigzag around the edges. 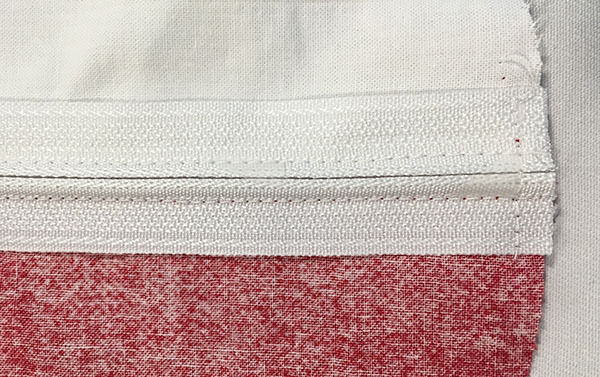 Layer the pillow front and back together, right sides facing, matching the red and white sides. Pin together near the center to keep the pieces from shifting while you’re pinning the piping in place. Sandwich the piping between the two layers and pin all the way around. 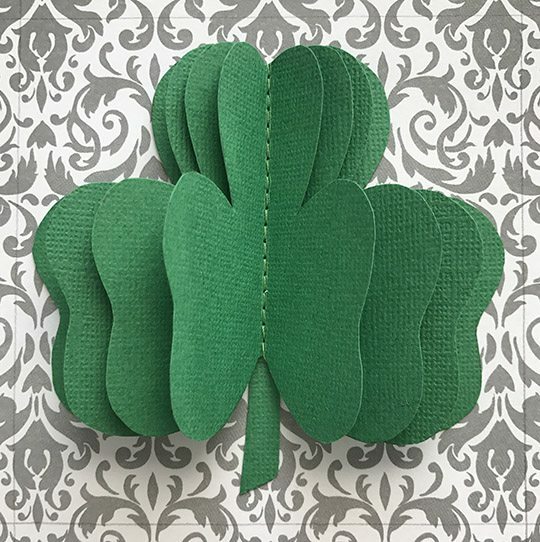 I LOVE Clover Wonder Clips for piping and binding. 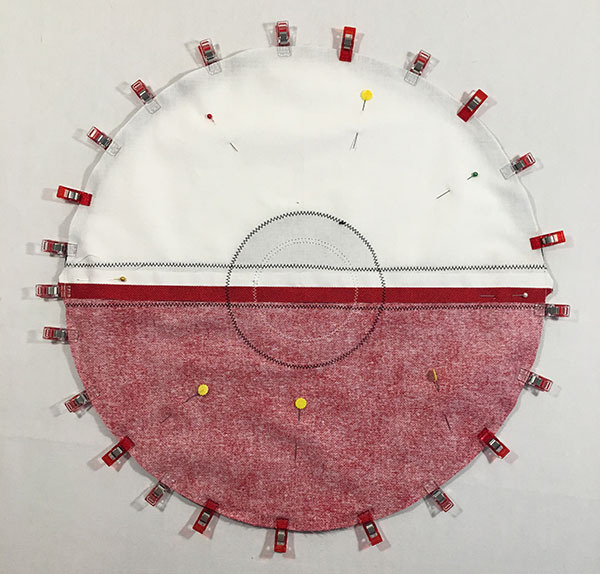 They’re so much easier than pinning, and you can use a ton of them without risking puncturing yourself while you’re sewing. I highly recommend them! 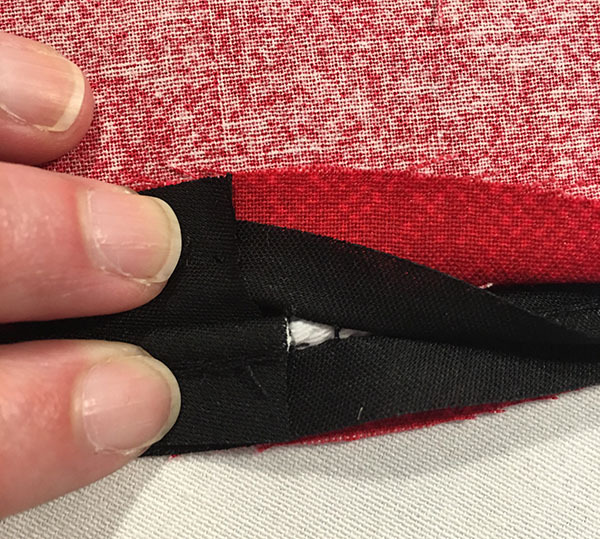 When you get all the way around to where you started pinning the piping, leave a tail that extends about 2″ past the starting point and trim off the rest. 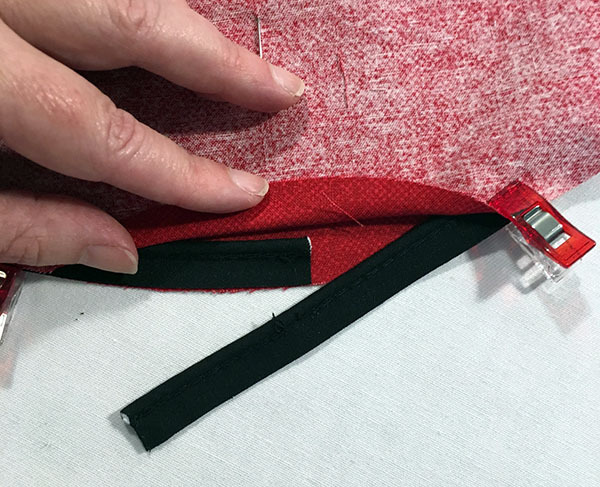 Use a steam ripper to carefully remove the stitching from the tail of the piping. Open up the bias tape and trim JUST the inner cord. Fold back the raw end of the bias tape wrapping the cord and slide it under the starting point, matching up the ends of the cords. Fold the bias tape around both raw edges and pin it in place. 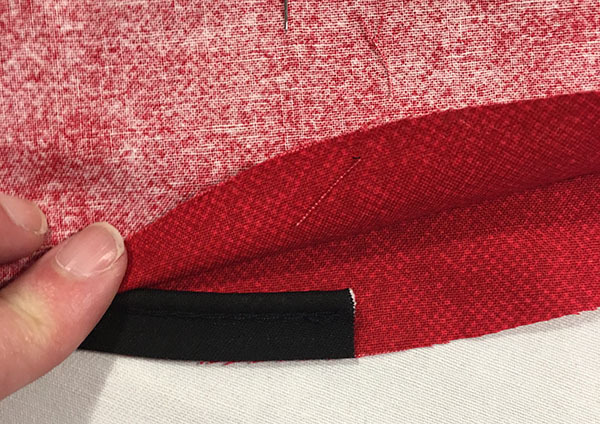 Make sure the zipper is open at least halfway then stitch all the way around the pillow edge, close to the piping. Turn the whole business right side out (Aren’t you glad you left that zipper open?) and press. Stick the pillow form inside the cover, wiggle it around until it’s centered, and zip up the cover. Done! *gasp* I love this! My two sons will got nuts over this; I’m going to have to try to make some for Christmas gifts. 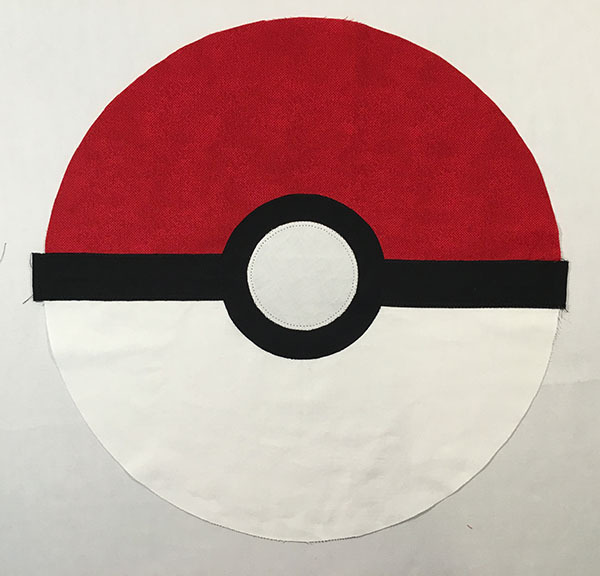 I’m redoing my son’s bedroom in a Pokemon theme, so this will be perfect! Thanks! too cute (I am sure my son will want one of these!) and great tute! i love the zipper instructions – I have been so terrified of sewing one though I did do one once at it was ok. The tape is brilliant! I just started using tape to hold zippers and it makes such a difference! It’s so much easier to keep them straight. No one at out house has the fever yet. Actually I only really understood what this was all about yesterday. I guess these things arrive a little later to Portugal than to other places. But I like that pillow notwithstanding, I don’t care that it’s Pokemon, I just like the pattern and the colors. Thank you for sharing at The Really Crafty Link Party this week. Pinned! Aw, thank you so much for sharing my project! Glad you liked it! 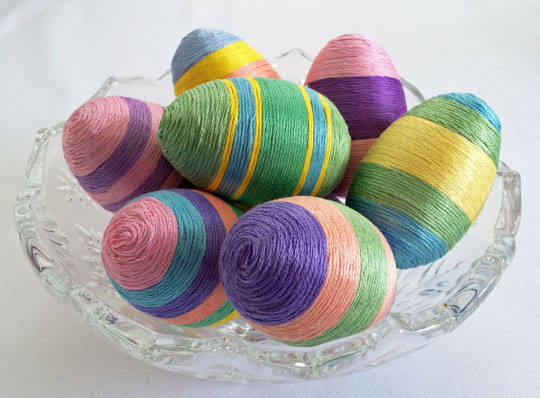 I liked the colors, too, and it’s an easy project to adapt for other uses. Awesome tutorial! Yes, it’s the same for us. It’s super hot here but, after the movies the other day the girls wanted to walk around the park catching them. I bet my teen would love a pillow. Her collection started when she was four. When Pokemon Go came out she was so excited. I have it on my phone too but, like I am learning. Thanks for sharing at the Inspiration Spotlight party. Shared. 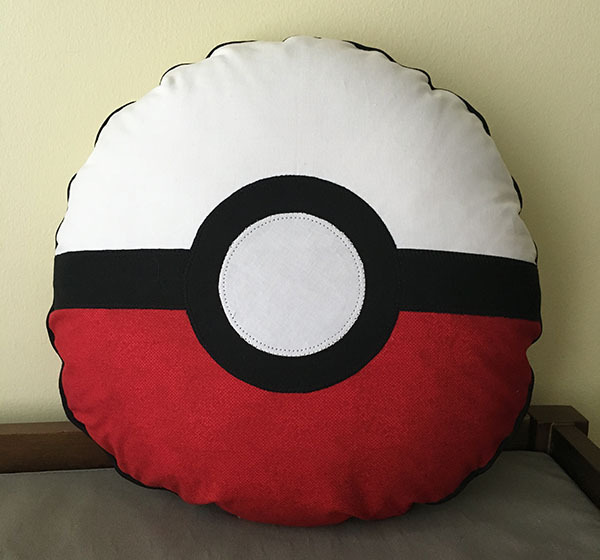 My kids would have loved this pillow when they were tweens and had about a million pokemon cards between the two of them. I’m sure I could come up with a few people who would still enjoy the gift of this pillow. Thanks for sharing how to make it with us at Creatively Crafty #ccbg 🙂 Have a great weekend! Thanks you for the awesome tutorial. I made two of the pillows using flannel fabric and they came out very nice. Should the pattern say 16″ pillow form instead of 14″. I tried the 14″ pillow form and the pillow insert was too small for the finished pillow, so I switched it to a 16″ pillow form and it fit perfectly. I checked my notes and I definitely had a typo in my instructions. Thanks so much for letting me know! I’ve updated the blog post. 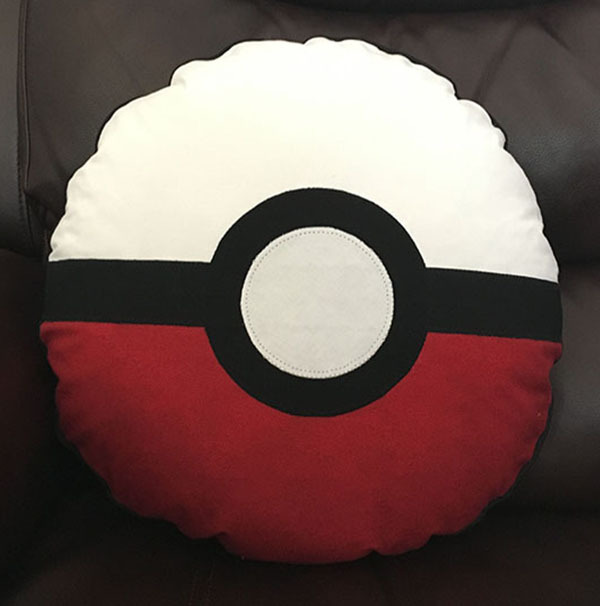 I love this pillow, and I’m not even into Pokemon! Great work! Thank you so much for including me in your roundup, Sandra! My 21 year old grand daughter has always loved Pokémon and her boyfriend too, The are about to buy their own home, this will make a perfect and very unexpected gift. I just know they will love it. Aw, what a sweet idea. Hope they like their housewarming gift!